A poor portmanteau picture comprising three one-act plays written by Noël Coward. There are too few examples of the urbane Coward wit to atone for the banality of the stories, while the observations on the types produced by the British class system are shallow to the point of platitude. 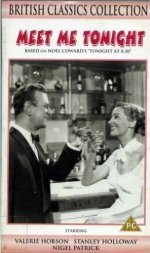 However, the performances stand up rather well, with Ted Ray and Kay Walsh cheerfully hurling insults as the unhappy music-hall marrieds in Red Peppers; Stanley Holloway dour and determined as the worm who turns in Fumed Oak; and, best of all, Valerie Hobson and Nigel Patrick brimming with charm as Riviera fraudsters confronted by burglar Jack Warner in Ways and Means.